The Galaxy, a DJ-duo made up of Arjen Lubach and Sacha Harland, was launched in 2015. 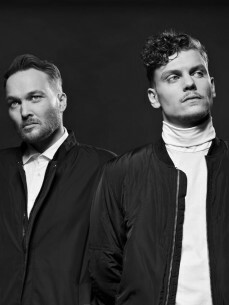 Soon after producing their first demo’s, the duo was signed by Amsterdam-based record label Barong Family, which resulted in the release of The Galaxy’s first EP: 'Bass Country Club'. Within their first year of touring, The Galaxy performed at notable European festivals, like Tomorrowland and Mysteryland, and different clubs in Russia, Germany and Switzerland. During this time they would also remix tracks by Moksi and Yellow Claw, and release their second EP: ‘Moon & The Stars’. Collaborations with Cesqueax, Mike Cervello and LNY TNZ followed short after when artists on the label came together to produce music for the first ever Barong Family album. With the support of acts like Yellow Claw, Cesqeaux and Laidback Luke, The Galaxy’s music has been able to reach a broad international audience in a fairly short amount of time. To expand this reach even further and reach markets outside of Europe, they teamed up with Ace Agency in early 2017, resulting in The Galaxy’s first tour in Asia. 2017 would also prove to be a big year music-wise. The Galaxy collaborated with Yellow Claw on a track featuring Gia Koka, a song that would make the cut on their ‘Los Amsterdam’ album. They also produced a track with Lil Debbie and started working on a new EP, named ‘Invaders’. The release of the EP would be kicked off at the end of the year with a single featuring Sophie Simmons, followed by three remaining club tracks. Over the course of the last 12 months, The Galaxy played a variety of European festivals during the summer season, toured Asia for a third time and worked on two more collaborative tracks for the second and third Barong Family album. With new music in the works and many more shows to come, The Galaxy shows no signs of slowing down any time soon.